Tobey Marshall (Paul) and friends are struggling to keep their garage business from going broke. He reluctantly accepts an offer from wealthy ex-NASCAR driver Dino Brewster (Cooper) to soup up a Ford Mustang for a big price. However, Tobey soon finds himself in a race that’s about revenge as well as redemption. Although light on plot and performances, the film delivers exactly what it promises. Devoid of CGI, the races you see are real and the stunts, really well done. Apart from Paul’s promising performance, it’s the supercharged cars that tear up the asphalt and steal the show in this one. Need For Speed achieves its goal – it looks and feels very much like an NFS movie, right down to the racing tracks. It’s everything else that it stumbles in – the characters, the story (or lack thereof), the boring protagonist, the generic blonde love interest, the stock baddie. To its credit Need For Speed does differentiate itself pretty well from the Fast and Furious movies. 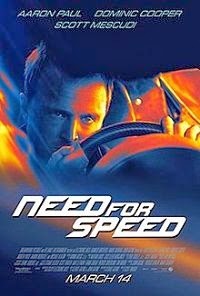 The latter actually borrowed heavily from NFS Underground but this movie uses real cars even in the crashes and big stunts to look more visceral. There are a couple of saucy action scenes, and the final race is fun. If only the film were a bit self-aware, or at least humorous to keep itself entertaining. At first glance, Need for Speed seems like a mediocre filler in the race-car genre until 2015’s Fast & Furious 7. It felt safe to assume that the film would be just that – a filler. However, it’s not. Though Need for Speed is nothing to write home about, it’s definitely a pleasant surprise. Though Need for Speed is in no way the next big race-car film, it’s an entertaining movie, perfect for a weekend. Autophiles and fans of race-car movies, in particular, will enjoy this film. Watch it if you’re looking for an entertaining film, but skip it if you want an original or thought-provoking film.